A couple days later I got around to taking it out of the box, putting it on, and shooting and upload a video of me wearing it. So, anyway, here are some brief responses to some of questions that I have gotten about this wind jacket/shell since I uploaded my video. How is the fit? I am not really sure why this is the #1 question that I have gotten, but it is by far the question that I have gotten asked the most. The jacket is a very athletic fit, so maybe that is causing folks with uhh, a fat tummy, some issues? Do not really know, but the fit for me is perfect, see the video at the bottom of this post. How is the breathability of the fabric? 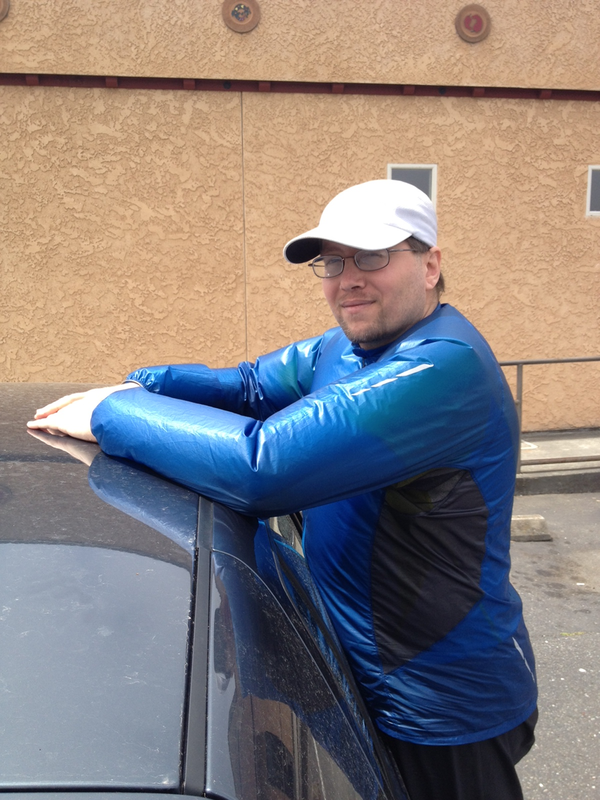 I would consider it about the same as the Montbell Dynamo Wind Jacket. That is, it is a good middle-of-the-road fabric. It does let in a bit of wind, but that also means that it breaths a bit better. As I tried to explain on this post over on reddit, there really is no “perfect” or “ideal” fabric for wind jackets these days, because we have so many to pick from with different CFM ratings that we can pick and choose for the specific adventure we plan on taking. The Veil is half the price of everybody else? It is a cheap piece of crap? Yeah, I actually got asked that exact question. And, I totally get it. When other wind jackets are over a $100 bucks (The Enlightened Equipment Copperfield is $110, Zpacks Ventum is $115, a Black Diamond is $120, the Montbell Tachyon is $100 bucket, a Patagonia Houdini is $100, the Arcteryx Squamish is an insane $160 bucks, and so on and so forth.) So when you see the price tag of $60 bucks for the Massdrop Veil, hey, I get it, I really do. The first thing to come to mind, for many, is that it is probably some cheap chinese crap. In fact, the fabric is from a South Korea textile company and the jacket is sewn in Vietnam, where many other high quality, top end, companies go to these days for the manufacturing of their garments. My guess is that Massdrop has finally reached a point in their company growth (mostly in their ability to work with foreign manufacturing companies) to be able to drive down the prices, and being the kind of company they are, they deal more with mass sells at a lower price, than smaller sells at a higher price. That is just my theory in all of this. Suffice to say, the quality is good, and if I can pay half the price for a piece of gear that is just as good as others out there, why not buy it at half the price! At this point in time, I think the Veil is the best made (quality of production) wind jacket that I have ever used or tested, and (I think) I have done more testing on wind jackets than most others in the world at this point. I thought you hate shirts with chest pockets? Oh, I do. I begged the Massdrop team during their development phase to offer a version without the stupid chest pocket. It was (and still is) one of my biggest feature-change-request if Massdrop ever does another generation of this wind jacket. How does the waist hem elastic do at keeping the wind out? For some stupid reason Massdrop did not put a hip hem tightener on the Veil. More on that in my section below of things that I do not like. The arm length looks to be too short in your video. Ok, that was not a legit question, but to whoever wrote that to me, I understand ;) Yeah, typical problem for me. Probably 90%+ of the top garments that I own have too short of arm lengths for me. I want to hike the pct next year, should I get a windshirt from zpacks, enlightened equipment, montbell, or massdrop? Well, I typically do not answer these type of questions that are “company vs company” questions. I have years of wearing Montbell products. And the wind jacket from zpacks is pretty nice, but I gave mine away after getting the one from enlightened equipment. Now I switch back and forth between the one from Massdrop and EE, mostly depending on what type of weather I am expecting, and if I plan on being ‘in-town’ much, as the Veil is a really clean looking wind jacket, good for those trail towns when you will need something to wear while having your other garments being washed. All that said, the tachyon and ventum are still really nice jackets, I just think the veil beats them out, with the copperfield coming in second. Do you know what the CFM is of the Veil? Yep, Massdrop has reported that the Veil fabric was lab tested at 11 CFM. Woman friendly? No, not really, to much of an athletic cut. Do you think it would be a good idea or bad idea to spray some Sawyer Permethrin on the Veil? Hmm, I am always hesitant to spray just about anything on wind jackets, with the consideration that it could result in the CFM getting screwed with in a negative way. From a chemical & fabric standpoint, Sawyer Permethrin should not harm the Veil fabric in anyway, my only consider is that it could result in a higher CFM of the fabric… of course, that could actually be a good thing if you think the 11 CFM is a bit low. But, let me just say, this is just me “thinking” it will, I have zero lab testing results to actually prove it will or not. For over 2,000 (two thousand) days of wearing my single pair of Montbell Dynamo wind pants (read my last review on them) and each season I have Permethrin on them and they have never had any negative chemical/fabric degradation. The pants have lost 100% of their DRW, but that happened years ago and was not a result of the Permethrin, just for day to day (and year to year, lol) use of them. So, back to your question… I think I will leave the answer to this one up to you and your thoughts on if spraying the garment might affect the CFM and if that it something you care about or not. The chest pocket. No big surprise here for folks that have followed my articles over the years. I loath chest pockets, on just about any top garment. Just a ‘me thing‘. But, it is my #1 wish for Massdrop to offer a version without a chest pocket. Arm lengths. The arm lengths need to be longer, at least for me. Another two or so inches would make things really nice. No two-way zipper. While I have never owned, nor tested, any wind jacket that did have a two-way zipper, it sure would be nice if one of these days somebody would add a two-way zipper to a wind jacket. Reason being: targeted ventilation. There are times when it is nice to vent out some air from the top of your garment, and there are times when unzipping the bottom of your wind jacket, to let air flow through, is nice. And, sometimes it is nice to do both, yet having half or so of the jacket still zipped up. No back zipper guard. While there is a top chin guard for the zipper (your beard will thank you for that), having a piece of fabric behind the zipper on the inside of the garment, makes things really nice for wearing a wind jacket as a Next to Skin layer, for those guys people with hairy chests. It is a simple addition in the manufacturing process and helps solve a problem. No bottom hem tightener. This is probably the biggest issue, overall, with the Veil Wind Shell. The lack of a simple bottom hem cord/tightener means that if there is not a tight fit between the fabric and your body, it can let massive amount of air flow into the jacket. This picture explains this problem, oh so well, while I was wearing a Montbell Tachyon. Well folks I think that about wraps things up for this post on the Massdrop Veil Wind Shell. It has been a wind jacket/shell that has impressed me. The 11-CMF places it in a rating that is a good all around wind jacket. Not really one that you want to use in blistering cold windy conditions (for those conditions, buy one of the EE Copperfield jackets with the ’20D ripstop nylon’ fabric, which has a 1-CFM rating!! ), but for the average day to day situations that most of us encounter, it really has been a nice garment to wear. And at half the price of pretty much every other wind jacket of any real quality, the Veil is kind of a no-brainer to buy. Add in the fact that the Veil is probably the nicest manufactured wind jacket that I have ever used, and well, I guess that really does say it all. Just go buy one of these! Hi John, I’ve followed you for a few years and appreciate your reviews. What size jacket did you order and what are your body/clothing measurements? In video, you appear to have a similar stature as I am. Thanks. Hello Luke. I am 5 feet 11 & 3/4 inches (~180 cm) in height. I was probably around 130 pounds (59 kg/9.2 stone) when this video was recorded. That would have put me at a BMI of 18. I bought a size medium.